Boroughmuir begin their build-up to the BT Charity Shield tomorrow when they host a four-team pre-season tournament at Meggetland. The BT Cup holders are due to take on Capital rivals Heriot’s at BT Murrayfield ahead of the Scotland-Italy game on August 29 to officially open the 2015/16 club season. Tomorrow, they take on Watsonians, Preston Lodge and Gala in a round-robin event, which ties in with the club’s RBS Rugby Force day. The three short matches will give Muir coaches Bruce Aitchison and Ben Fisher a chance to look at their wider squad, including some of the new arrivals they have brought in. 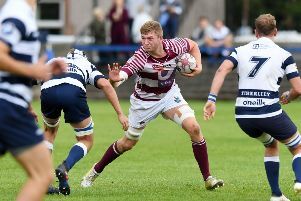 Marcus Di Rollo and Simon Taylor, the coaches of BT National League One outfit Watsonians, will also be keen to see their new recruits in action, while for Preston Lodge it will be a good test for them against opponents from higher divisions. The event starts at 2pm with Boroughmuir taking on Preston Lodge and Watsonians facing Gala. The final fixtures are due to start at 4pm. In other pre-season action tomorrow, Currie are due to host Musselburgh at Malleny Park.